For those who spent the weekend enjoying themselves rather than fretting about the future of American democracy, we just learned that the constitutional crisis looming over the Russia investigation is already underway. The New York Times obtained a 20-page letter Trump’s attorneys sent Special Counsel Robert Mueller’s team in January, arguing that he could not have obstructed justice because he has total, unfettered authority over the Justice Department. Trump could “terminate the inquiry or even exercise his power to pardon if so desired,” they claim. On Sunday Rudy Giuliani — who replaced John Dowd, one the attorneys who penned the letter — went on TV to elaborate on this expansive view of executive power. As usual, Giuliani gave a freewheeling performance that generally made his client sound guilty. He tried to distance himself from the arguments laid out in the letter, telling This Week that his predecessor put forth “the broadest possible point,” but “we don’t have to go there” because there are less constitutionally questionable ways of proving Trump’s actions were justified. I would not go that far. I would not go that far, George. I mean, John — you’d have to ask John exactly what he’s relying on for that. I wouldn’t go that far. I think under circumstances where there’s no — at best there’s ambiguity as to whether there was intent. 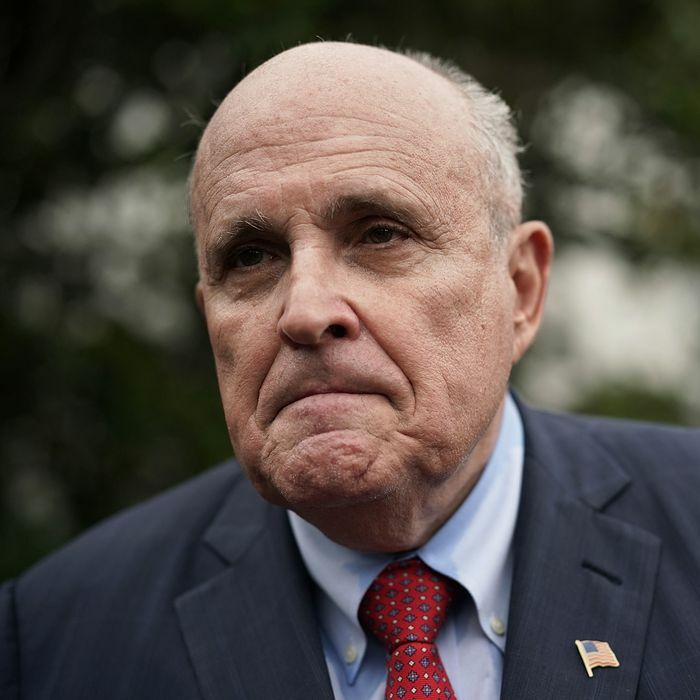 Echoing Trump’s claim during the campaign that he could shoot someone in the middle of Fifth Avenue and not lose any voters, Giuliani explained that if there’s a criminal in the Oval Office, the law can’t touch him until the Legislative branch acts. Though Giuliani was speaking theoretically, it’s still stunning to hear the president’s lawyer musing about him murdering a specific political enemy and getting away with it — or at least, it should be. In one day, Giuliani went from arguing that the president probably has the right to impede an investigation and pardon himself, to saying that he can’t even be indicted for murder. Though he repeatedly claimed that the president has no interest in doing any of this, he put forth the idea that the president is above the law in every imaginable scenario — and once we’re debating the legality of our kinglike president committing murder, a little obstruction of justice doesn’t seem like a big deal. Giuliani assures us that we don’t have to worry about there being no legal check on Trump’s power (according to his interpretation), because if the president commits criminal acts there’s a political solution: impeachment. But it’s already unclear what Trump would have to do for the Republican-controlled legislature to turn on him, and Giuliani is trying to wear away the political will to hold the president accountable for anything but the most heinous crimes.